But-ing. Let us count the ways to but. The steady advance of theocratic fascism with its multiple unspeakable acts of violence in scores of venues all around the world in an attempt to create a global caliphate forcing the rest of us to live under the Sharia is really, really bad. Most people agree with this but there are lots of people who find a way to qualify it with a “but”. Let us count the ways. But lots of Muslims consider cartoons of the prophet insulting. But religion is important and we need to respect people’s faith. But would we want to see negative representations of black and gay people? But religion is the same as race. But Israel kills a lot of people too. But we shouldn’t gratuitously insult people. But these terrorists are just petty criminals. 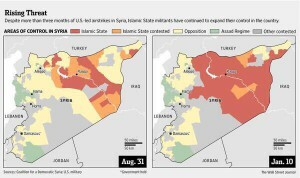 But these terrorists should be ridiculed. But they are trying to provoke us so, if we allow ourselves to be provoked, they’ve won. But we should consider whether we would publish these cartoons as part of our normal editorial policy. But there is no threat to us. But it is important not to over-react to acts of pure barbarism. I must have missed some. Anyone seen any others? Laugh if you can, but be afraid. 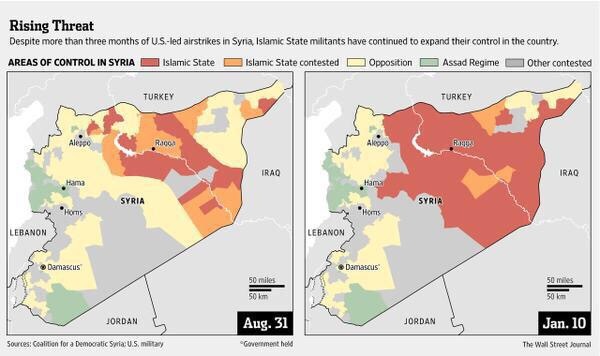 The red bit is controlled by theocratic fascists. Not much to laugh about. I like Dan Hannan. I rarely agree with him, many of his views are politically toxic, but I respect him. He’s a right-wing Conservative, self-described as coming from the Whig tradition, and he’s an MEP. He was a high profile supporter of the People’s Pledge, the campaign for an In-Out referendum on the EU, and I was its Director. We used to do a little double act banter at fund-raising dinners: he would do the highbrow politics and the Euroscepticism; I would do the lowbrow campaigning and the Europhilia. He wants the UK to leave the EU; I want us to stay a member. Dan is extremely good company and the most dangerous sort of political opponent there is: he understands your position better than you do and he respects it. He is well read, well prepared and unfailingly polite. If the Trots had done their Trotskyism Dan Hannan style, they’d be running the Labour Party by now. Because I take Dan seriously, it was with some sadness that I read his reaction to the Charlie Hebdo murders, and I scribble this blog post with considerable trepidation. He introduces several dichotomies: we are asked to believe that the Charlie massacre was not an act of holy war but merely a crime; the perpetrators concerned not soldiers, but common criminals, not religious zealots but pathetic figures. And then, rather strangely, he suggests the public policy response to Islamism should be to ignore its stated rationale as mere self-description, and subject it to ridicule. Seriousness or ridicule are his choices. Oi journalists! MPs tweeting campaign pics. It’s called democracy and it’s great. 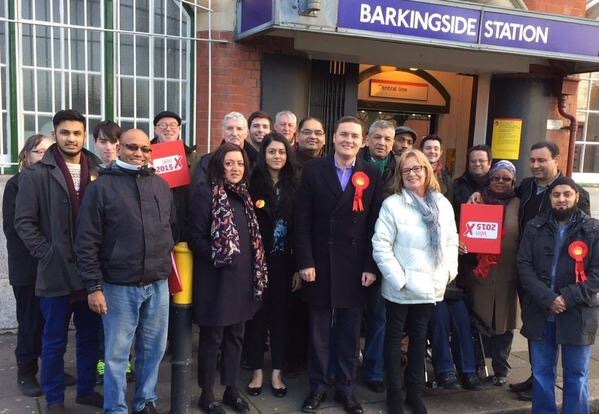 Wes Streeting is standing for Labour in Ilford North. There is currently a deep and widening fracture between the British people and their political parties, apparently. The chasm is so big that the political party as a concept is in terminal decline. The main two parties are in particular danger because their joint share of the national vote has fallen dramatically in the last six decades: it’s all over now, baby blue and baby red. These assertions have become truths all but universally acknowledged; it’s all a bit boring really. People do not join parties in large numbers any more. The electorate has slammed its doors on the main parties after saying “you are all the same”. People feel alienated and disenfranchised, believing that politicians are only in it for themselves and only come round at election times when they want votes and are nowhere to be seen during the rest of the electoral cycle. Yada yada yada. 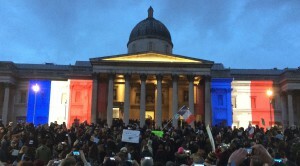 I first heard about today’s London vigil for the Paris victims on Twitter; a friend was going and looking for someone to meet up with. 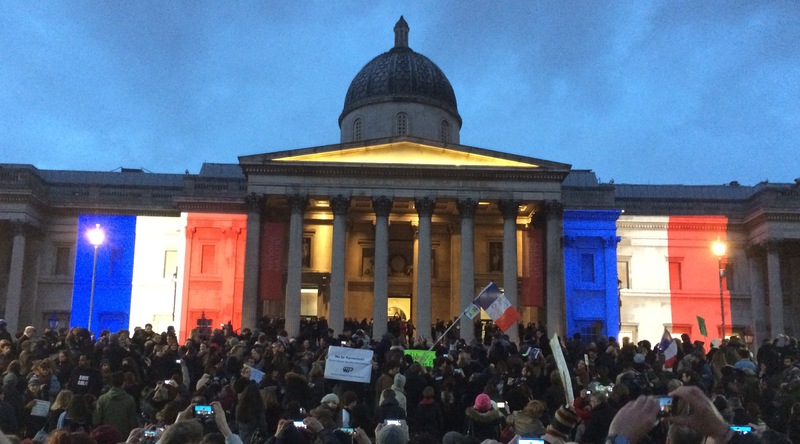 In Trafalgar Square’s fading light several thousand people, mostly French, stood in quiet reflection. Many holding hastily produced “Je suis Charlie” posters, some displayed “je suis juif, others “je suis Ahmed.” We felt all in it together, for once. The air was sad with palpable grief, without being sombre. Politesse suffused the square. The lack of tension was partly aided by the welcome absence of any evidence of the Trotskyism that has polluted every Trafalgar Square rally I’ve attended over more than 30 years. Three years ago someone commissioned the following from me. They didn’t publish it because they were worried it would upset Shami. Meh. It’s 3 January so I thought I’d let it see the light while raising this year’s glass. Here y’go. I’m no legal expert but 48 years in South East London has schooled me on where Stephen Lawrence died. My youthful drinking was done in pubs near where, a few years later, he was murdered by Gary Dobson, David Norris and others. Every journey on the 122 bus to visit my first girlfriend ended at the very stop where they stabbed him. I know they are guilty. Defendants and families aside, no one says otherwise. Dobson and Norris are not the Eltham Two, a modern day Birmingham Six. No MP will make a name fighting to clear theirs; no barrister will work for reduced fees to free them. Books may be written but they will only confirm the convictions. Dobson and Norris are where they belong and will, in time, be joined by the others. They weren’t fitted up by the system; they were protected by it: by its incompetence, corruption and institutional racism. For years. 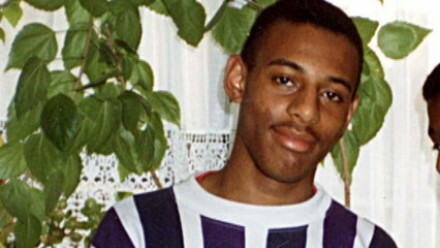 Their victims, Stephen Lawrence and friends and family, were stitched up. Until yesterday. You are currently browsing the mckenzied.com blog archives for January, 2015.